Posted by admin in activity reports, eruptions, Indonesia, Rinjani. 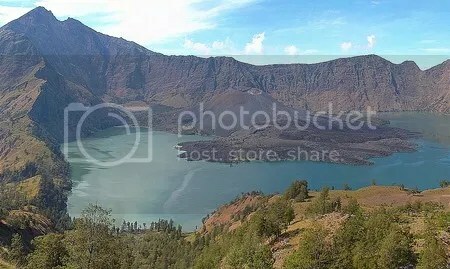 Mount Rinjani on Lombok Island, Indonesia, is continuing to erupt, as it has been doing pretty much continuously since the current phase of activity began on 2 May. The eruption is located at Barujari cone, which has been the focus for eruptive activity since records began in 1847 and can be seen in Nusa Tenggara’s wonderful picture above. A bulletin released on 17 June by the Indonesian Directorate of Volcanology and Geological Hazard Mitigation gives copious details of seismicity and eruption plume activity since 7 May, reporting frequent shallow earthquakes and episodes of harmonic tremor, and ‘thick white smoke’ reaching up to 1500 metres above Mount Rinjani’s summit. The bulletin also reports what sounds like impressive strombolian activity, with incandescent material being thrown 200 metres into the air from Barujari’s summit crater and landing up to 500 metres away. There is also a report of a lava flow some 600 metres wide that has extended 100 metres into the lake. Indonesian volcanologists see no immediate prospect of this eruption coming to an end, according to reports in the local press. Posted by admin in activity reports, Alaska, Batu Tara, Chaitén, Chile, Colombia, Costa Rica, Dukono, Ebeko, Ecuador, eruptions, Galeras, Hawaii, Indonesia, Japan, Kamchatka, Kilauea, Kliuchevskoi, Mexico, Papua New Guinea, Peru, Popocatépetl, Rabaul, Redoubt, Rinjani, Russia, Sakura-jima, Sangay, Sarychev Peak, Shiveluch, Slamet, Suwanose-jima, Tungurahua, Turrialba, Ubinas, United States, Weekly Volcanic Activity Reports. 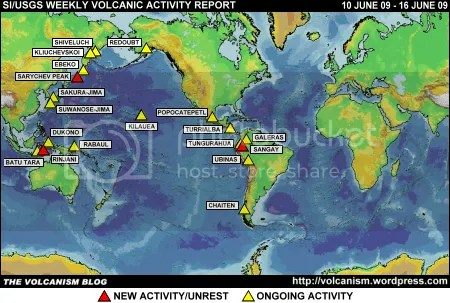 The Smithsonian Institution/United States Geological Survey Weekly Volcanic Activity Report covering 10-16 June 2009 is available on the Global Volcanism Program website. The following is a summary and not a substitute for the full report. New activity: Rinjani (Indonesia), Sangay (Ecuador), Sarychev Peak (Russia). 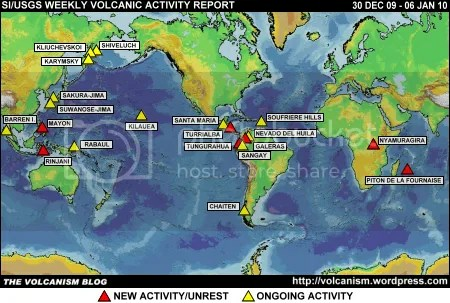 Ongoing activity: Batu Tara (Indonesia), Chaitén (Chile), Dukono (Indonesia), Ebeko (Russia), Galeras (Colombia), Kilauea (USA), Kliuchevskoi (Russia), Popocatépetl (Mexico), Rabaul (Papua New Guinea), Redoubt (USA), Sakura-jima (Japan), Shiveluch (Russia), Suwanose-jima (Japan), Tungurahua (Ecuador), Turrialba (Costa Rica), Ubinas (Peru). Posted by admin in activity reports, Africa, Alaska, Arenal, Batu Tara, Chaitén, Chile, Colombia, Congo (Dem. Rep.), Costa Rica, Dukono, Ebeko, Ecuador, eruptions, Galeras, Hawaii, Indonesia, Japan, Kamchatka, Kilauea, Llaima, Nevado del Huila, Nyiragongo, Rabaul, Redoubt, Rinjani, Russia, Sakura-jima, Shiveluch, Suwanose-jima, Tungurahua, United States, Veniaminof, volcanoes, Weekly Volcanic Activity Reports. 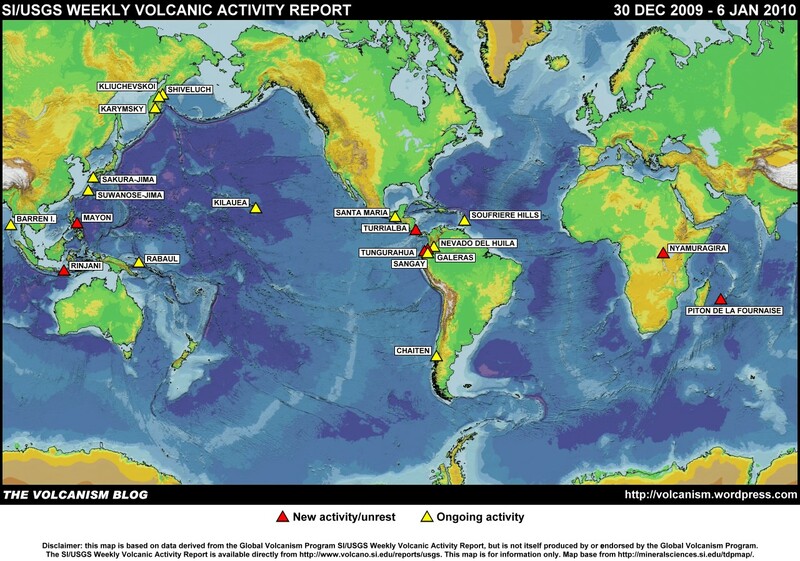 The Smithsonian Institution/United States Geological Survey Weekly Volcanic Activity Report covering 6-12 May 2009 is available on the Global Volcanism Program website. The following is a summary and not a substitute for the full report. New activity: Galeras (Colombia), Nyiragongo (Dem. Rep. of Congo), Rinjani (Lombok Island, Indonesia), Veniaminof (Alaska, USA). Ongoing activity: Arenal (Costa Rica), Batu Tara (Komba Island, Indonesia), Chaitén (Chile), Dukono (Halmahera, Indonesia), Ebeko (Paramushir Island, Russia), Kilauea (Hawaii, USA), Llaima (Chile), Nevado del Huila (Colombia), Rabaul (Papua New Guinea), Redoubt (Alaska, USA), Sakura-jima (Japan), Shiveluch (Kamchatka, Russia), Suwanose-jima (Japan), Tungurahua (Ecuador). Posted by admin in activity reports, Alaska, Asama, Bagana, Batu Tara, Chaitén, Chile, Cleveland, Colombia, Dukono, Ebeko, Ecuador, eruptions, Fernandina, Galapagos, Galeras, Hawaii, Indonesia, Japan, Kamchatka, Karymsky, Kilauea, Krakatau, Mexico, Papua New Guinea, Popocatépetl, Rabaul, Redoubt, Reventador, Rinjani, Russia, Sakura-jima, Shishaldin, Slamet, Suwanose-jima, Tungurahua, United States, Weekly Volcanic Activity Reports. The Smithsonian Institution/United States Geological Survey Weekly Volcanic Activity Report covering 29 April 2009 to 5 May 2009 is available on the Global Volcanism Program website. The following is a summary and not a substitute for the full report. New activity: Bagana (Papua New Guinea), Fernandina (Galapagos Islands), Galeras (Colombia), Krakatau (Indonesia), Reventador (Ecuador), Rinjani (Lombok Island, Indonesia), Shiveluch (Kamchatka, Russia), Slamet (Java, Indonesia). Ongoing activity: Asama (Japan), Batu Tara (Komba Island, Indonesia), Chaitén (Chile), Cleveland (Alaska, USA), Dukono (Halmahera, Indonesia), Ebeko (Paramushir Island, Russia), Karymsky (Kamchatka, Russia), Kilauea (Hawaii, USA), Popocatépetl (Mexico), Rabaul (Papua New Guinea), Redoubt (Alaska, USA), Sakura-jima (Japan), Suwanose-jima (Japan), Tungurahua (Ecuador). Indonesia may seem to be having more than its fair share of volcano alerts lately, but given the very large number of volcanoes to be found in that country it probably is actually a fair share. Semeru, Karangetang, Ibu and Slamet are all on the second-highest alert level of Orange (Siaga), while thirteen other volcanoes including Krakatau, Kerinci and Kelud are at the next level of Yellow (Waspada). The latest addition to the latter group is Mt Rinjani on Lombok Island, which has gone to yellow alert following ‘two small explosions’ on Saturday afternoon. The area of the national park surrounding the volcano has been closed to tourists as a safety measure. Eruptions has more details and background: Yet another Indonesian volcano on alert.